Introduce your child to the fabulous world of puppets. Parents can also join in with the children and have a wonderful time bonding and learning a new skill together. 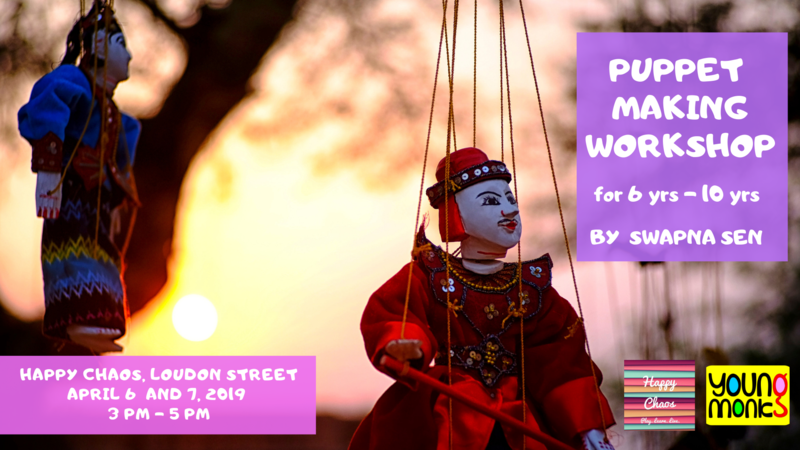 This Puppet making workshop is conducted by the veteran puppeteer, who has years of experience in teaching the art & skill of puppet making and puppet theatre. She is also a Fullbright Scholar. Puppet making helps in the development of imagination and creativity of a child, leads to improvement of motor skills, boosts confidence in the child to articulate his thoughts. Venue : Happy Chaos, Maruti Building, 4th floor, Loudon Street, opp Bell Vue Nursing Home. Swapna Sen is a painter, organizes puppet theatre with puppets made by her. She completed her Masters in painting and crafts from art college way back in 1971. After that, she had organized many exhibitions in India as well as abroad. She was one of the members of ‘The Puppet’, directed by Raghunath Goswami. She had travelled France and Russia as part of the puppet-group contingent on the occasion of India Festival. As a Fulbright Fellow in puppetry she is one of the instructors at The Centre for Cultural Resources of Govt. of India. At present she is the chief coordinator of ‘Simple Puppet’. She has been the teacher and mentor to many successful puppeteers in Kolkata.